1.Peel the apples and cut them into small pieces. Throw out the core. 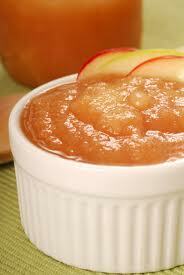 2.Put the apple pieces and lemon juice into the blender or food processor. Blend until the mixture is very smooth. 3.Pour the mixture into two small bowls and stir in the sugar and cinnamon. That is really awesome and seems delicious....! !